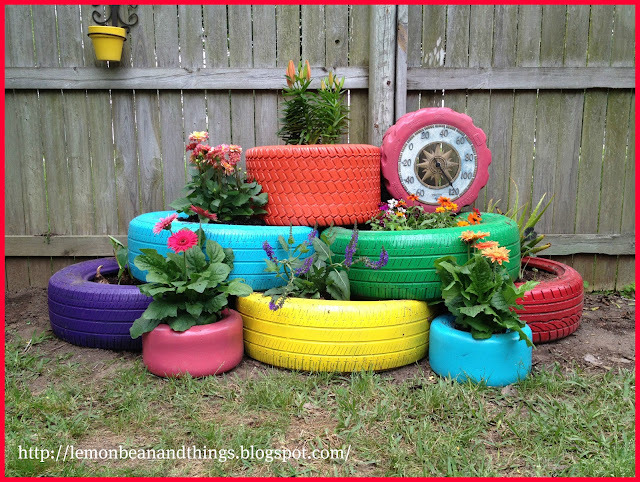 I saw the same photo on Pinterest that everyone else saw... you know the one with flowers flowing out of some colorful tires. I knew I had to do it! I had five tires in my garage ironically enough, and after searching a friends place I found some smaller cute ones. I laid out the tires in the spot where I had pulled up a long above ground vegetable box. I went to Lowe's and bought some spray paint (actually made two trips, as I forgot the all important pink & orange!). What had me in a quandary for about a week, was what & how was I going to keep and hold the dirt in the tires without having to use a lot of soil, and just in the off case I might want to move them one day. I knew that something would come to me, but in the mean time I needed to get the painting started! We played around with the design & color combinations for a few days until we finally come up with what we thought we wanted to do. Still had to come up with a way to hold the dirt in the tires without using a ton of soil. I searched around on Pinterest until I saw a photo on how to make a vertical planter. They used burlap or plastic backing, but I wanted to use something I already had, as I was trying very hard to stay within the recycle, reuse or up-cycle mode & wanted to keep the project as cheap as possible! At this point I had spent $40 bucks on paint! That's when it hit me that I have plenty of bags that hold the duck's corn! They are a plastic burlap bag of sorts, and would be just....Perfect! We gathered all the tools we thought we would need our for the project. 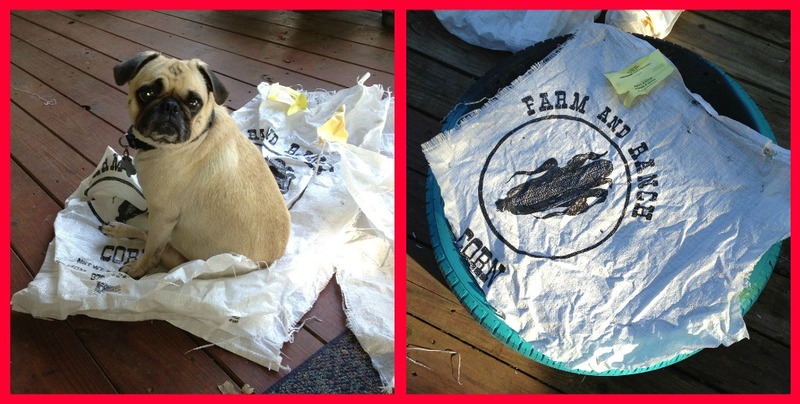 Our morning started with Lemon trying to help us straighten out the burlap bags so we could cut them open. We just laid the bags over the tires and cut enough to cover the holes. My first thought was to just staple the bags on the bottom of the tires and fill then up. After a few minutes of consideration we felt that would be fine for the ones laying on the ground, but the ones on the upper levels we would have to come up with a support system. We had a few pallets laying around (yes that's another project taking place), so we pulled a few boards off one of the pallets to help with the support of the dirt. I did not want the dirt to lay on the boards, as they would deteriorate & the dirt would fall through from the weight of the soil. 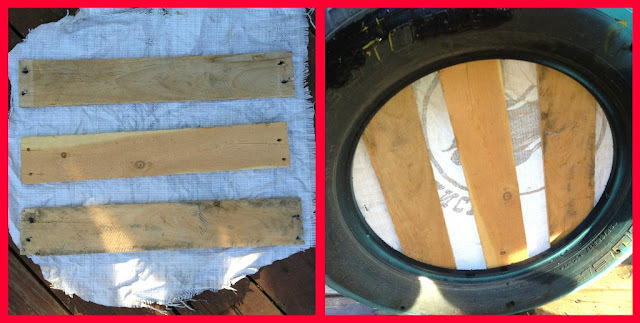 So we cut out three boards per tire and stapled the them onto the bag and inverted them into the tires. 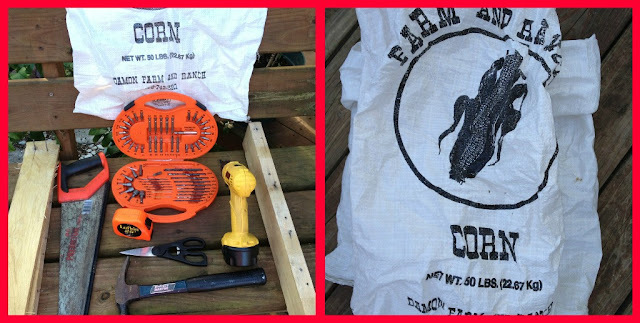 This way the plastic burlap bag would hold the dirt & protect the wood slates, while the wood slates would help support the dirt in the tires. 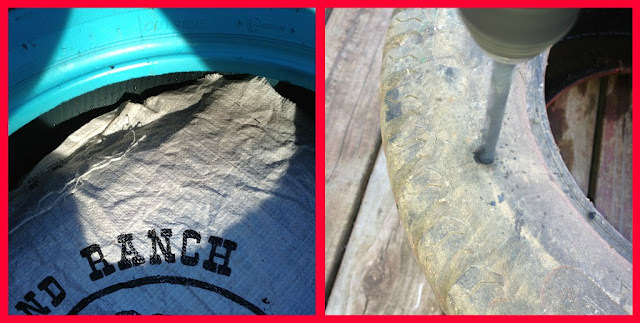 Now we needed to drill some more hole in the tires for drainage, and tacked down the plastic bag inside the tire until they could be filled with dirt. This was taken in May, as you can see the Easter Lilies are almost gone. I split a fern and shoved a bunch of bulbs in the top tire. This shot was taken December 21, 2012. The tires have shown the wear from the Texas heat and have faded. Pink and Orange do not like the sun! The Ferns in the top tire are starting to come in! Oh, I like this soooooooo much. I've got some old tyres lying around waiting for this project. Thank you for sharing with the instructions included! still look at the tires everyday! I am thinking about going higher and bigger!! Have a great day! LOVE THIS! So glad I found your blog. Janiece, Thank you so much! Thank you for the instructions, I have been trying figure out what paint to use, and what to support the tires with. FLjewels23....I saw a cool idea the other day about using empty water bottle as a filler for pots so you do not use so much dirt and it helps keep the weigh down. Please add plastic empty water bottle in the side of the tires! This will help with drainage and as I said with the weight, and using less dirt or soil! I am experiencing a small settling issue with my tires. It is nothing that can not be fixed, but the tires are so flippin' heavy that I have to have help leveling them back. 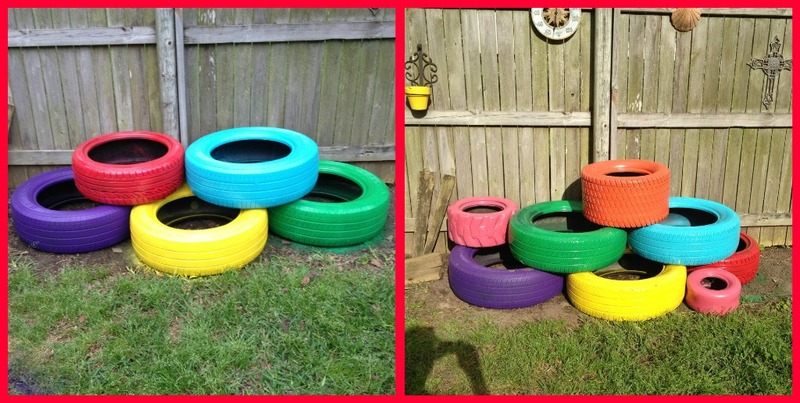 Do not be afraid to use all colors on the tires! Good luck and send me a photo once you get your project done! Cheapest filler ever...AIR! Thanks for the tip. 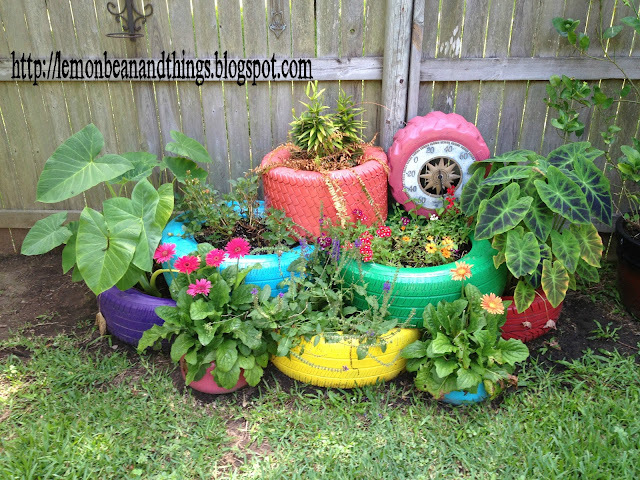 Was initially searching for fillers for tire planters besides dirt and not only did I find what I was looking for, I found a better design. Thanks twice over. Matthew..Thank you! I also updated my instructions to include the empty water bottles. Did you use latex spray paint and was it regular or for plastics? Also, did you prime the tires first? Love your tires! I used regular Valspar from Lowe's. I used the "Gloss" Paint & Primer in one for indoor/outdoor use. I sprayed two coats, but one can of paint did each tire, and I did NOT use primer before hand, although I am sure you could. I saw a tire recently and they used white! I wish I would have done a white tire! Have a great weekend! Excelente idea, quiero hacerlo en el colegio donde trabajo como parte del proyecto ambiental. Enviaré fotos cuando lo tenga. mil gracias por cuidar el ambiente y permitir que otros lo hagamos. This is a great alternative! However, if you need to, there is a tire disposal in Chicago that I've enjoyed using their services. Hi, I had tried to use spray paint on the tires but the paint is chipping away.. Did you face the same problem? Hi! I did not have a problem with paint chipping off my tires. I sprayed them one sunny afternoon & I did not clean them in anyway. I used Lowe's Valspar paint. The only issue I am having now is that the paint is fading from the sun. My plan is next Spring to pull them up, re-level them and re-paint them. I am also going to take half the dirt out and fill them with empty plastic water bottle. I hope that will keep them more level. Good luck! I read somewhere here you are in Texas, I am in Texas as well, West Texas actually. Hi! I am glad you like my tires, thank you! South Texas here! As I have said before...fill your tires with empty water bottles (about 20 collapsed bottles per large tire), this keeps them lighter and you do not use as much dirt! Sorry about being UNKNOWN but I was not sure how to change that. Denise. I am excited for you! Good luck and show me some pictures when you get finished!! 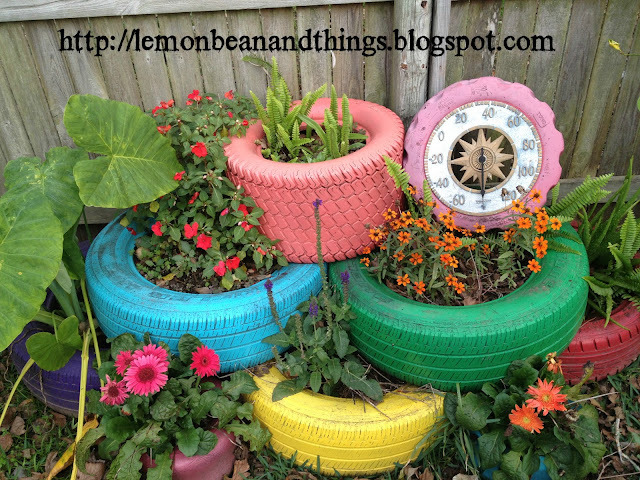 we were looking for a project for kids to do in the wildlife garden here is Westcliff on Sea in the UK and were toying with the idea of using tires..never thought of painting them though, its excellent. Might just be pinching your idea if you don't mind. I love this idea and will be featuring it in an article I'm writing for SheKnows.com. I plan to use a photo from this blog post and will include a photo credit and link back to your site. If you have any questions or would prefer that I not use the image, please contact me. Thanks so much! My email address is elainaverhoff (at) hotmail (dot) com. Thx! Elaina, Sent an email!! Thanks!! Thats a nice blog which give a suitable info about tires toowoomba thanks to share such type of info with us.I want to continue with your blogs. Reut, Can you tell me what you are using it for? I am so glad you posted this step by step. I have wanted to do this since seeing it online but had no idea how to hold the soil in the top tire. I have a small space in front of my town house and I am excited to get it done. Jubillee...I hope you have success with your tires. I love mine!! I can't wait to try this! As a fellow South Texan, we can really "pretty up" this part of the state ! Thanks Kathy! They are still holding up strong other than the fading of the pink & orange paint. The sun is just not kind to those colors. I plan on next February (2015) expanding & adding veggies to the tires. I wanted to this Spring, but the weather just never was cooperative with my schedule!! Good luck and shoot me some pics when you get yours done! Hi - I want to ask you if I can use the picture of this great tire flower planter in an article? I will of course link directly to your site. I am writing for a danish website for houseowners (www.bolius.dk), and right now I am working on an article about recyceling tires – and I stumpled over your fantastic blog. This is really informative. Very good article sharing Tires. If anyone wants to Buy Tires Online then visit our site Tyreonwheels and get tire in lowest price. I really gathered Lot of information from your blogger regarding the car services If you feel you have to change or buy a new car don't be hesitate because even it's a kinda junk you can get some money for it by the use of service like you.. The only issue I am having now is that the paint is fading from the sun. My plan is next Spring to pull them up, re-level them and re-paint them. I am also going to take half the dirt out and fill them with empty plastic water bottle. I hope that will keep them more level. I have really enjoyed seeing and reading about your planter. Thanks for the step-by-step instructions!!! 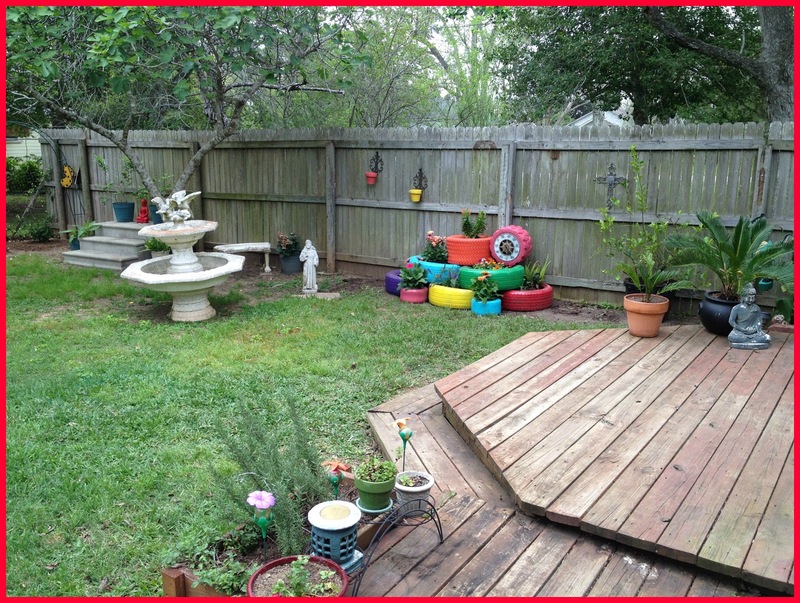 I hope to share your link with my gardening site on Facebook. I know your planter will be a big hit! Shop at your local Pawn Shop! Shamelessly Promoting my ETSY shop! 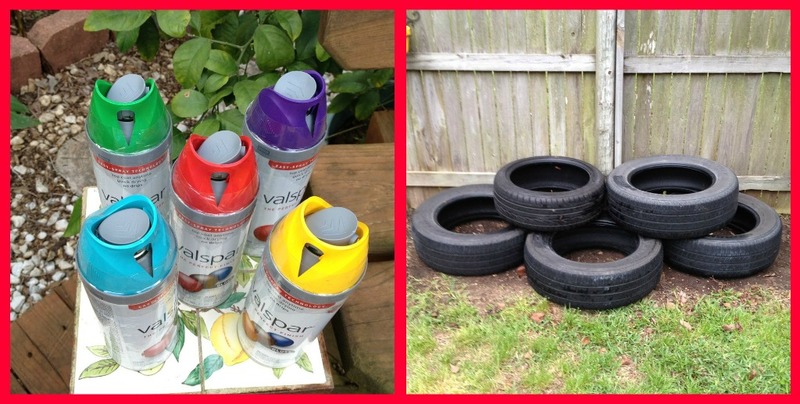 Soil Saver & Recycle Trick!